When you’re buying supplies for a job or your inventory, you need to know that you’ll receive the quality materials your clients want. You also need to work with a vendor who can deliver the products on time and provide you with support when it’s time to place another order. Finding a reliable distributor doesn’t have to be hard. When you trust the team at Nalboor Tiles you can be confident that you’ll receive the beautiful marble tiles you need along with the great customer service you expect. We carry a range of products, including an impressive assortment of marble. This includes engineered stone, natural stones, porcelain tiles, and tumbled tiles. We stock everything from brilliant white Bianco Dolomiti to deep red Rojo Alicante. You can get the right finish for your project now, and you’ll have access to more materials for future renovations. Our tiles are typically available in 12, 18, and 24-inch tiles, so it’s easy to create the perfect finished look for your project. Whether you’re working with a large commercial building or restoring a century home, we have the marble options that your clients are dreaming of. In addition to having a stable inventory, we also offer quality stones that are artfully manufactured to bring out their beautiful colors and patterns. As you add more people to the supply chain, you increase the risk of problems. You may also run into an issue where any challenges are blamed on another party, and you’re ultimately the one left trying to clean up the mess. We take the stress out of ordering wholesale marble because we’ve removed the middlemen. Not only do we wholesale our marble, but we also take care of the mining and manufacturing. There’s only one supplier between you and the raw product that’s in the ground, so you’ll only have one vendor to worry about. This allows us to provide you with superior communication, quality, and customer service. We’re able to keep things running smoothly so that your shipment will arrive on time. If there is a problem and the shipment is delayed, we can notify you right away so that you’ll know what to expect. We’re able to ship directly to your office or the job site, so you can also save time on transporting the tiles at your end. What Else Can You Get Out of a Marble Wholesale Distributor? Another great benefit of choosing us as your wholesaler is that we can exert a higher level of quality control. From the moment we scan the ground for stones, we can look for the finest pieces. We pay close attention to manufacturing to achieve excellent consistency in regards to colors, sizes, and veining. Not only will the shipment that you receive today be consistent, but we can also provide you with the same excellence in future orders. Homeowners who are doing a project themselves may only need 200 square feet of tile. They can afford to shop the clearance racks because they’re not going to be worried about getting more of the tile in the future. However, this isn’t the case for you as a reseller or contractor. When you’re offering products for new home construction, you may have regular orders for 200 square feet of Crema Marfil marble. Your clients expect you to have it in stock, and you need to be able to deliver. With our assistance, you’ll have access to the materials that your client base has come to expect. This means that, as a retailer, you won’t have to worry about marking down a few leftover tiles because you can just keep replenishing your high-quality stock. As a contractor, you can offer the same beautiful options to one client after another. If you want consistency throughout a larger project, you can count on us to have several thousand square feet of tiles for a bank or a hospitality center. As you’re able to consistently meet your customers’ needs and demands, you’ll see more repeat business. When it comes to any project, pricing always matters. You know that you’ll pay a little more for quality marble, but you still need to have room to turn a profit within your own business. This is really where buying from a wholesaler makes a difference. In addition to Nalboor Tiles everyday reasonable rates, we also have special pricing structures for contractors and bulk orders. The more you decide to order at one time, the more money you can save. You can either pass the difference on to your customers through specials, or you can use the savings to improve your profit margins. Many of our customers use our bulk pricing to stock up on supplies so that they’re ready to go for jobs. 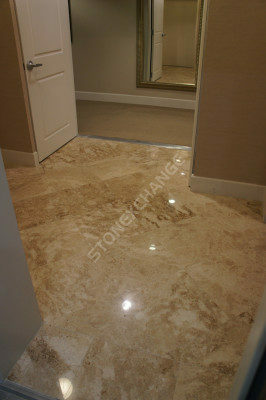 Imagine how happy your customers will be to learn that you can start on a bathroom renovation right away because you have their Breccia Oniciata marble tiles in stock. Delight your customers by always having a selection of Calacatta Gold marble ready for them to choose from. Keep a healthy supply of Bianco White Carrara marble on hand so that you can finish bathrooms and basements in record time. You’ll save by buying in bulk, and you’ll also be able to make your business more efficient in the process. When you have high-end clients who want fine materials, you need to have the right inventory on hand. There are plenty of wholesalers out there who buy from the manufacturers without knowing what type of quality they’re getting. Nalboor Tiles knows that our stones are of excellent quality and consistency because we do the manufacturing on them ourselves. We can maintain a consistent inventory because we own the quarries. We’re able to provide you with wholesale pricing and special deals on bulk orders, so you can save money and enjoy fast delivery on all types of marbles. Whether you focus on commercial or residential projects, call Nalboor Tiles today at 305-501-4548 to learn more about us and see how you can benefit from our wholesale services. You can also contact us online.